Just past the Falcon Structures’ office, the sound of construction hangs in the air. While construction is offsite for the future recipients of our containers, it’s very onsite for us. As a recently hired writer and boxpert in training, I wanted to investigate where the grinding and the fireworks smell was coming from to figure out what exactly I would be writing about for Falcon. 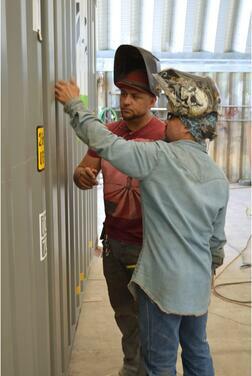 So, I shadowed Falcon Structures’ senior welder, Aaron Ramirez, as he split a 20-foot shipping container in half. The hissing of hoses and the whirring of grinders were constant under the production domes as Aaron and Adrian Barron, a Falcon welder/fabricator, sized up the container. The plan was to split a 20-foot container into two 10-foot containers which could later be used as storage containers or equipment enclosures. Aaron showed me the raised metal strip that ran from the top to the bottom of the container. They were going to cut exactly along the edges to keep the walls of the future containers intact. It sounded simple enough, but then I considered that they were cutting though 16-gauge corten steel, not cardboard. The final quality of the container would also depend on how clean those cuts were. Aaron pulled out his tape measure and began marking up the container. “People should know about the quality that goes into the work. We’re taking the time to make sure we’re getting the best cut by getting the best line,” he said. Sparks flew as they sliced with the plasma cutters. Aaron emphasized the importance of using guides, which look like curved metal yard sticks, versus cutting free hand, which tends to lead to more ragged, crooked lines. After a demonstration, Aaron handed me the plasma cutter and the guide. “Don’t worry, it’s not rocket science,” said Aaron. But then again, this tool melts through steel by super heating a gas to the fourth state of matter: plasma. It felt a bit like rocket science to have a substance found in stars confined to a handheld tool. From there, they pulled the divided container apart. The welding team later welded additional sheets of metal to the open backs of the halves, thus sealing them into two individual 10-foot containers. While they weren’t going to let me weld on an actual container – a choice I’m sure Falcon customers appreciate – Aaron and Adrian found some scrap metal so I could get a feel for the task. They were patient as I made lumpy molten globs. The bead of smelt glowed beautifully through the darkness of the mask, but I found it difficult to make the precise hand motions needed. I ended with a sort of passable inch. Yet, the tiny ridges that should run along a weld like tightly layered scales on a snake’s back were irregular and widespread. The work Aaron and Adrian did that day impressed upon me the years of experience and creativity that go into each container project. The production team at Falcon takes an active role in problem solving when a customer asks for a unique design and even seems to have some fun along the way. For instance, Aaron doesn’t stop welding when he clocks out. He does metalwork to create art pieces and tools at home. 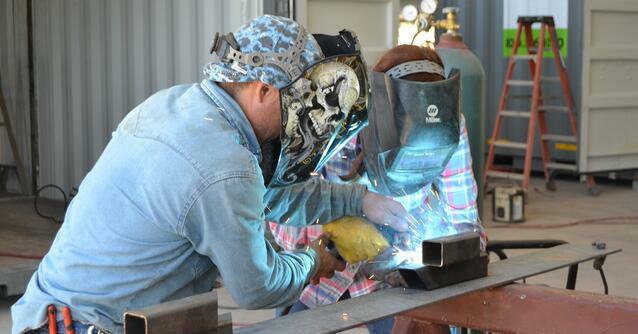 Cutting and welding aren’t just a job for him; it defines him as a craftsman and artist. I only got to see the cutting and welding first hand, but in the background, Falcon’s electricians, carpenters, and painters were retrofitting the containers for their second lives as mobile offices, workforce housing, and more. These containers literally couldn’t exist without their expertise. The production zone is noisy because nobody is standing around to chat; they’re working every moment on the clock. So thanks, production team! It’s going to be easy writing about containers knowing you thought about every cut and detail. Find out first hand how much our team cares for every project. Contact us to learn more. Read another Falcon employee’s experience with containers: Eating Your Own Dog Food: What It’s Like to Work in a Container Office.